Stay tuned for the release of The Local Music Podcast: Episode 4 – Scott Moreau. The podcast will be release on the Acadia Music Group Blog at 10 AM EST, Tuesday, April 9th! Scott Moreau is from Litchfield, ME and holds a BFA in Music Theatre from Illinois Wesleyan University. After a lifelong dream of being a professional baseball player, Scott turned to the stage after seeing a life-changing performance of Les Misérables in London his freshman year of high school. Through his years in high school and college, he found a love for not only musical theatre but choral singing, directing, sound design and stage combat. Since graduating from IWU he has been traveling the country, performing everywhere from his home state of Maine to Osaka, Japan. Favorite roles include: Willy Conklin in Ragtime (Seaside Music Theatre), Dan in Joseph and the Amazing Technicolor Dreamcoat (Maine State Music Theatre), Man 2 in Ring of Fire (Broadway Palm West Dinner Theatre), Man 1 in I Love You, You’re Perfect, Now Change (Dutch Apple Dinner Theatre), Johnny Guitar in Johnny Guitar The Musical (Cortland Repertory Theatre and The Theatre Barn), Bill Sykes in Oliver! 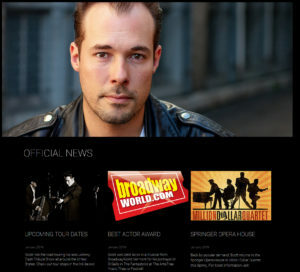 (Arundel Barn Playhouse) Sky Masterson in Guys and Dolls (Broadway Palm Dinner Theatre), Johnny “Leadville” Brown in The Unsinkable Molly Brown (Dutch Apple Dinner Theatre) and Johnny Cash on the 1st National Tour of the Tony Award winning musical, Million Dollar Quartet. He has since reprised his role in MDQ in the Regional Premiere at the Ogunquit Playhouse, Tony Award winning Papermill Playhouse, Riverside Theatre, and Harrah’s Casino Las Vegas. His experience not limited to performing, Scott made his professional directorial debut with Ring of Fire at the Round Barn Theatre in 2011. He has since directed MDQ at Farmers Alley Theatre in Kalamazoo, MI and assistant directed at the Springer Opera House, both while doing double duty as Johnny Cash. He made his television debut on the series finale of HBO’s Emmy Award winning Boardwalk Empire as Young Jim Neary. In 2013 he released a Johnny Cash tribute, Home Of The Blues: A Tribute to Johnny Cash at Sun Studio now available for digital download and on CD.